One hundred years ago today St. Louis experienced deadly flooding. The problem wasn’t the Mississippi, it was the River Des Peres! In August 1915, St. Louis was flooded. All roads leading to the suburbs were cut off, and in Maplewood, the waters reached the second floor of some homes. The water was a mile-wide in Forest Park. Three bridges in the park were washed away, the Zoo’s Bird Cage and Bear Pits were flooded. The platforms at the old Delmar Station were destroyed. Passengers at the Wabash Station were surrounded by seven feet of water and had to be rescued by firefighters. Other people were trapped in their homes, and some even drowned. By the time the disaster was over, 11 people had died and more than 1,000 homes were lost. The cause of the disaster was not the Mississippi River but the smaller River Des Peres, which ran along the City’s western edge. 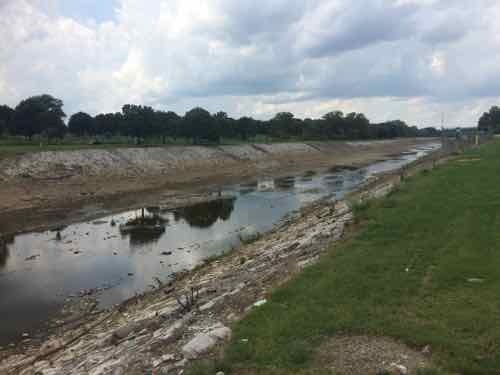 River Des Peres, or “River of the Fathers,” was named after two Jesuit priests who founded a mission on its banks around 1700. Problems associated with flood and sewage control became obvious as St. Louis grew. 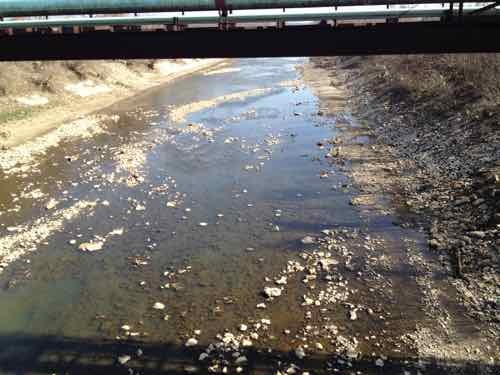 In 1887, city officials planned to drain River Des Peres and Mill Creek. 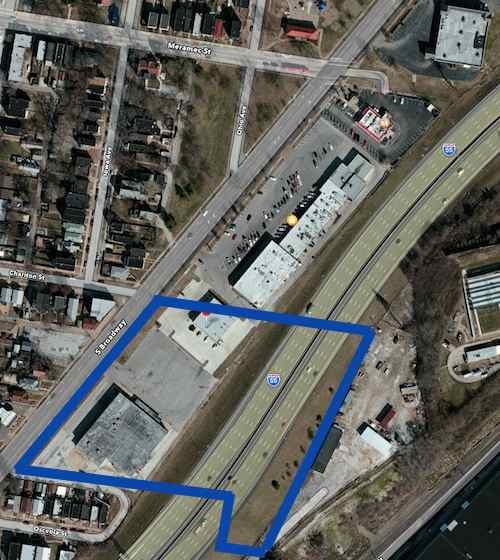 This plan was not completed, though, and River Des Peres had become an open sewer by the early 1900s. Perhaps the first sewage the River des Peres received was from St. Louis’ Central West End chamberpots. In response to the volume of waste, the city wrote an ordinance in 1887 “to prevent discharge of sewerage or offensive matter of any kind into the River des Peres.” If the city had funded the ordinance, then a separate sewer system would have been built and the River des Peres’ history might have taken a different course. Instead, the government of St. Louis began a trend that has plagued the river for more than a century: St. Louis would support ideas to protect the River des Peres as a sewer more than as a river. As St. Louis grew westward, so did the expanses of pavement. With less open ground to soak up the rains, the River swelled with runoff. The River des Peres flooded in 1897, 1905, 1912, and 1913. The flood of 1915 killed 11 people and forced 1025 families from their homes. 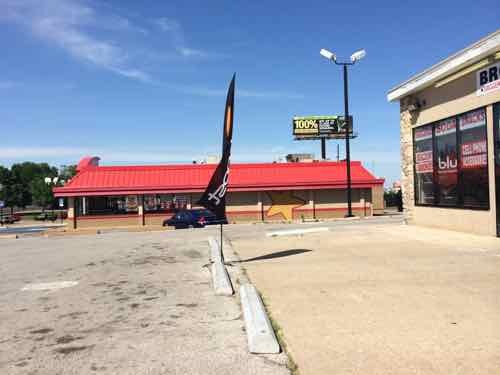 Flooding – not sewage – prompted St. Louisans to action. Mayor Henry W. Kiel called for a hydrologic study, which was completed by W.W. Horner and presented to the St. Louis Board of Public Service in 1916. St. Louis voters chose to implement Horner’s recommendations, which cost $11 million. The bond issue vote was in 1923 — 7 years after the plan was presented. Explore any city enough, and at some point you’re likely to walk on water, so to speak. San Francisco is full of ghost rivers. So are Washington, D.C. and Los Angeles. 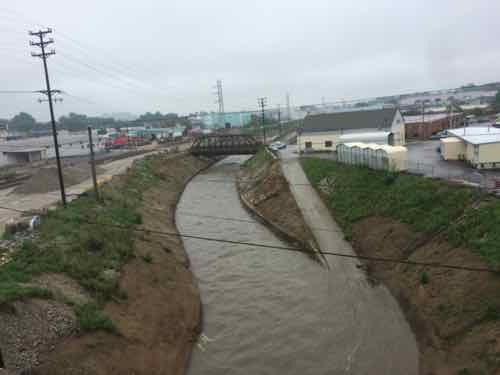 In the urban core of Baltimore, up to 98 percent of streams are underground. MSD spokesperson Lance LeComb said the new pipe will increase the plant’s capacity to take in sewage, and also serve as a back-up in case the existing “force main” ? which dates back to the 1960s ? has a problem. Hopefully this will keep our sewage out of the waterways and not create more problems! The River Des Peres starts in St. Louis County, flash flooding remains an issue. One of the most frustrating things about using a wheelchair in the public right-of-way (ROW) is how many routes are 99% accessible — the 1% inaccessible part can be a bigger obstacle than you might think. 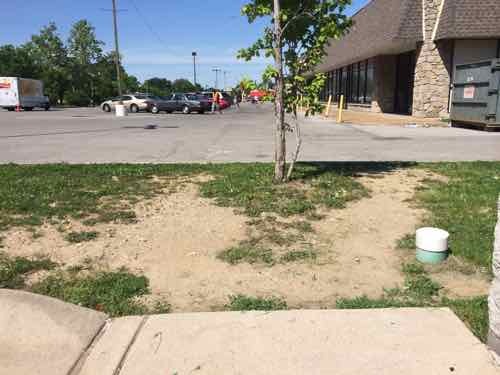 Today’s example shows the lack of thought put into making an entire corridor accessible — it’s done piecemeal. Saturday morning my husband and I took the bus to the Missouri Botanical Gardens, we spent a few hours there. Afterwards we decided to have lunch at OLIO — just a short walk (map). Turning North on the East side of Tower Grove Ave I encountered a problem after crossing De Tonty St. The curb was lower to the right, but not enough that I could get up onto the sidewalk. Thankfully the bike lane exists, I used that on high speed to reach the next street as quickly as possible. At Lafayette Ave I looked back South and the same problem exists on this end! Good thing I couldn’t get onto the sidewalk at the other end — I couldn’t have gotten off on this end! I crossed Lafayette Ave and got back on the sidewalk without any issues. I had no other problems after lunch, catching our bus a couple of blocks further North. So why hasn’t this small section been updated in the 25 years since the Americans with Disabilities Act (ADA) was signed into law? Fragmentation is my best guess. 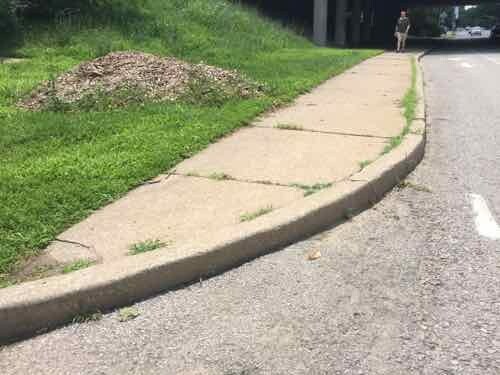 This sidewalk runs under I-44, so MoDOT is likely responsible instead of the city. Another possibility is gerrymandering, both ends of this sidewalk are in the 19th ward. Yes…seriously! This area is in the very bottom left area pf the 2011 ward boundaries. Click image to see a larger ward map. To be fair, most likely this was in a different ward(s) before 2011. Still, the 19th Ward is probably the worst in the city for curb ramps. My experiences have shown over and over again that nobody is concerned about making corridors accessible from end to end. A person examining Tower Grove Ave would’ve caught this issue. Maybe someone has but they can’t get funding from the 19th ward budget to correct it? Maybe MoDOT is aware but it too busy avoiding tolling I-70 to worry about two ramps. 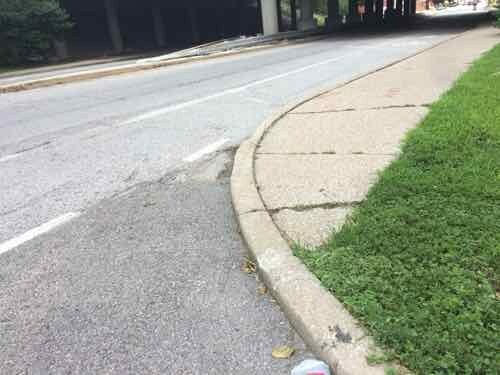 The West side of Tower Grove is better — only one end is missing a ramp, at Lafayette. The St. Louis region needs a high-quality light rail system to connect Florissant/Ferguson and our densely populated South Side to Downtown and the Central Corridor. Now is the time to push for economic investment to help stabilize some of the city and county’s most vulnerable communities. 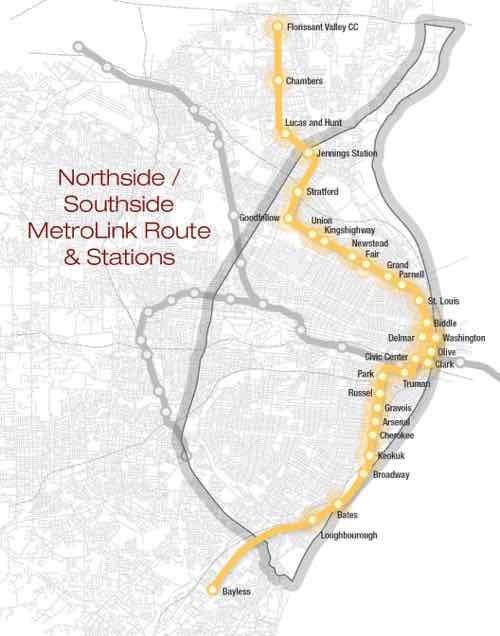 We should be demanding that our local leaders prioritize North Side/South Side MetroLink expansion as imperative to making St. Louis a progressive and economically just metropolitan area. Would light rail be more “just”? Those who don’t actually use public transit on a daily basis may think so, but the reality is the opposite. Map currently being circulated, click image to view larger PDF in Scribd. The above map is from the North South MetroLink Expansion Facebook page. #74 (Florissant) MetroBus is the most direct option. This takes 1 hour and 1 minute with up to 68 potential stops along the way. That’s a long time, I’ve done it many times in the last year. MetroLink (Red) to Hanley Station plus #36 (Spanish Lake) MetroBus. This option takes a total of 1 hour and 2 minutes. This route is 23 minutes on light rail with 10 stops, 10 minutes between modes, and 29 minutes on bus with up to 40 stops. I’vc also done this a few times. 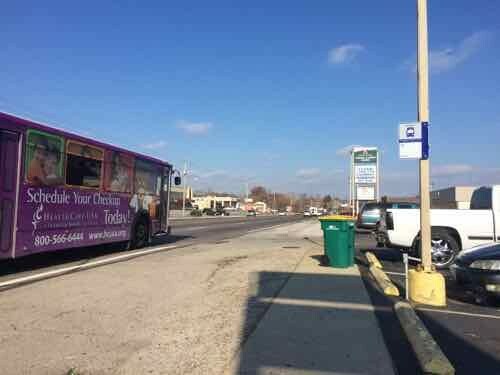 The two primary choices for getting from downtown to Florissant Valley CC, click image to view in Google Maps. Note that times may vary, just depends on when you depart. 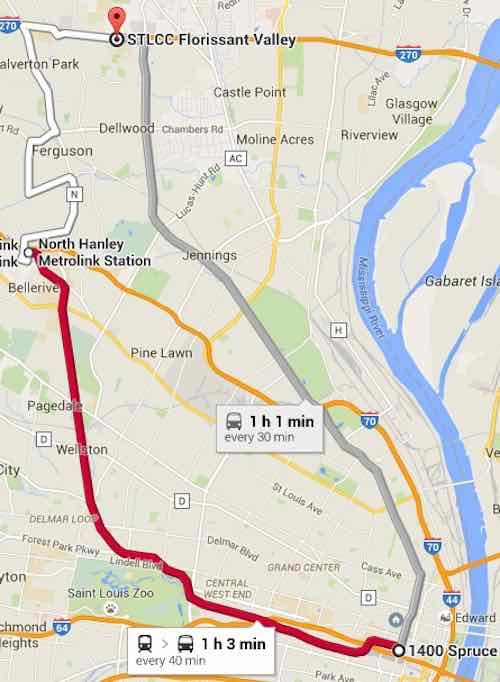 The proposed light rail line would certainly cut this down to 30-45 minutes. That’s a good thing, right? Not necessarily. Very few ride the #74 MetroBus end to end. It’s a busy bus route but people get on/off where they need to. With 68 points of access it serves the corridor well. More frequent headways would be better though. 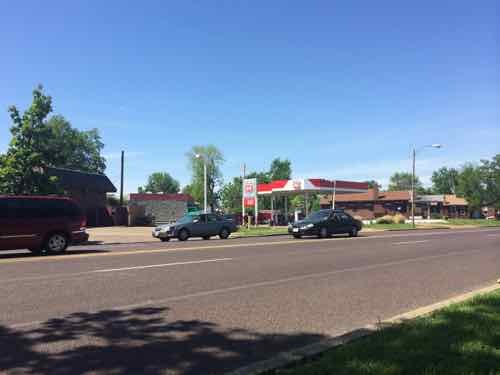 The proposed light rail route would most certainly mean the #74 would end at a new Jennings Station MetroLink Station at Goodfellow & W. Florissant, rather than duplicate service from that point North. From Goodfellow & W. Florissant it currently takes 24 minutes to reach the community college at the end of the #74. The light rail map floating around would instead have just 4 stops including the start & end stops! How is that just? 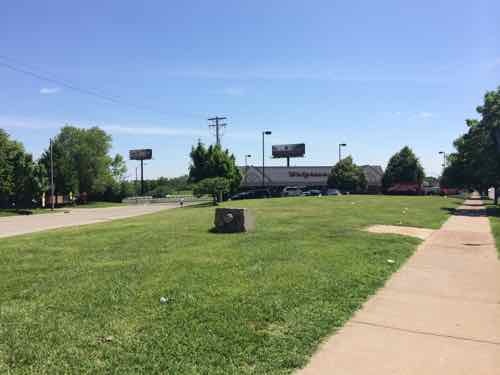 The proposed light rail has zero stops in the area of W. Florissant that most uses transit. Sure a light rail train may be faster and be more frequent, but that’s little consolation if you’re walking a mile further in the rain to get to a limited access point. For many current riders they’d now just end up having to walk their entire trip. Unless we ran a bus on the same route as the light rail train, which kinda defeats the point of spending tens/hundreds of millions on light rail. How long does it take to get from 14th & Spruce to Cherokee & Jefferson on these two MetroBus routes? #73: 17 minutes, running every 30 minutes weekdays, with up to 18 points of access in that distance. #11: 16 minutes, running every 20 minutes weekdays, with up to 19 access points. So how many stops would this “just” light rail make to serve the “densely populated South Side”? Five! The density isn’t concentrated at just 5 points! Only a person who doesn’t understand transit can ague that spending millions while reducing 17 access points to 5 is “fair, just and equitable.” For example, everyone who works & shops at Jefferson Commons would now have to walk further. Sorry folks, remember this is “just” as your grocery trips are longer. On the one hand, it is exciting to see renewed interest in light rail in St. Louis County. Yet on the other hand, it is alarming that the expansions mentioned did not include a north/south route, but instead focused on the Clayton-Westport, Lambert-Florissant and Shrewsbury-Butler Hill lines. These three lines fail to provide service to the region’s most densely populated areas and many communities that have the highest need. Northside/Southside light rail also fails to address actual needs — it would provide service for whites who are uncomfortable riding the bus with non-whites, see Race, Class, and the Stigma of Riding the Bus in America. You can have a free train running every 5 minutes 24/7 but if a person must walk a mile to reach a point of access they’re not going to use it. Stop pretending it benefits them. 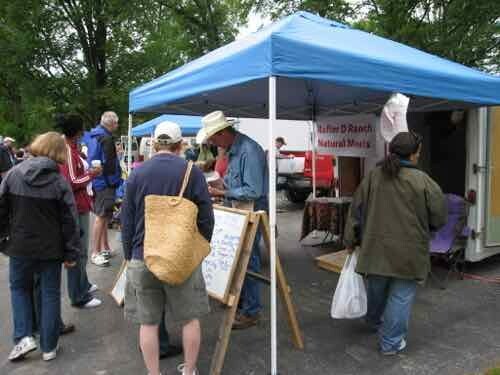 My first photo of Tower Farmers’ Grove Market; 9:30am on the very first day. The speeches haven’t even begun opening the Tower Grove Farmer’s Market but if the first few hours are any indication, it will be hugely successful. 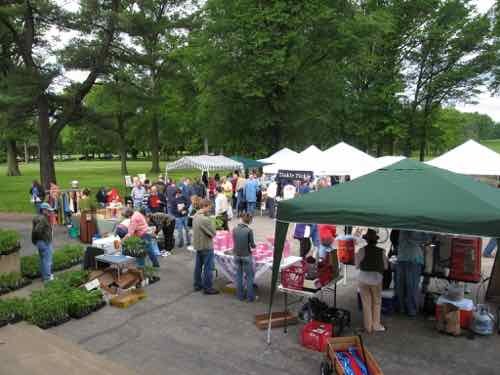 Occupying a small paved area west of the Pool Pavilion (which itself is on the West side fo the traffic circle), the market was full and vendors and paying customers. 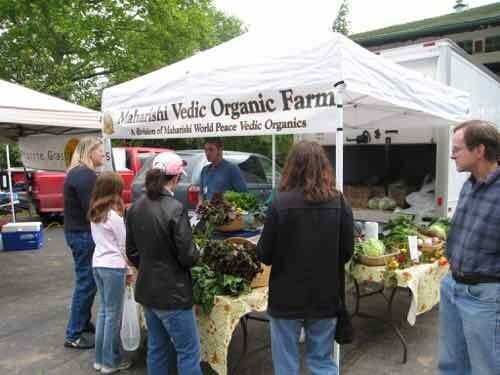 Organic produce, live plants, eggs and meats. 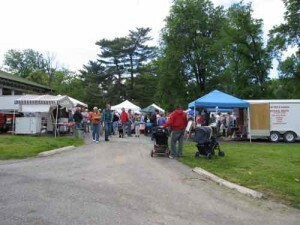 Other local items such as handmade soaps, bread, and pasta rounded out the selection. The only problem was really a good one, lots of people and bicycles. It was crowded but that added to the feeling of success. Had the same number of people and vendors been spread over a wider area it wouldn’t have been as good. Bike parking was an issue so some secured their bikes to the fence of the nearby tennis courts or light poles. Hopefully before the end of the market in October some bike racks can get installed nearby. 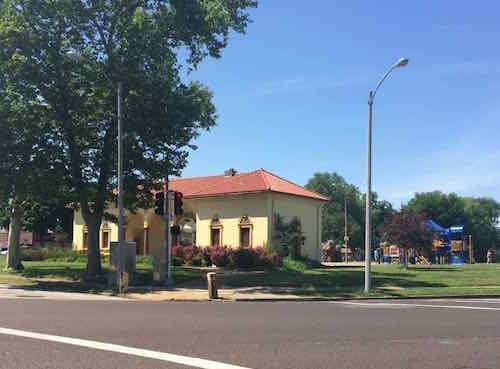 Joining the Friends of Tower Grove Park might help that cause. 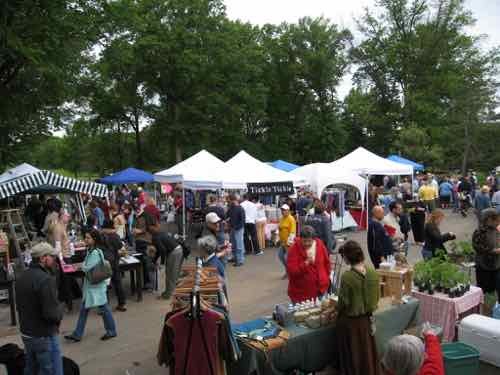 I noticed many residents walking to the farmer’s market both from Tower Grove South and Shaw neighborhoods. That is really great as I’d hate to see so many cars in the park that someone starts thinking a parking lot is needed. Big kudos to all the organizers, sponsors and elected officials (including Ald. Jennifer Florida), for making this happen. They’ll match up to $20! Congrats to Jenny, Patrick, and everyone else on the start of the 10th season! In May of last year I posted about a drive-in theater that replaced a quarry, itself soon replaced by I-55 (see May 26, 1954: South Broadway Drive-In Theater Opened). 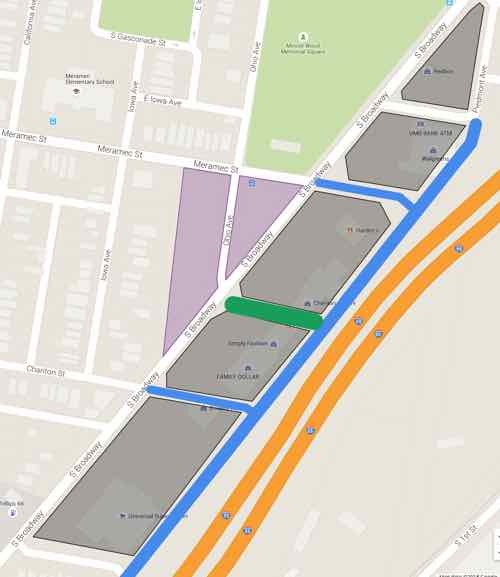 The blue lines mark the approximate outline of the 1964 theater site. Click image for map to area. In the coming weeks I’ll take a look at the commercial development along this stretch of Broadway and share my concept for an urban redevelopment. But I got married a week later and never got to it. Recently a friend inquired about my ideas so here they are…finally. Before I get into my solution I want to show you some of the problems I hope to solve. 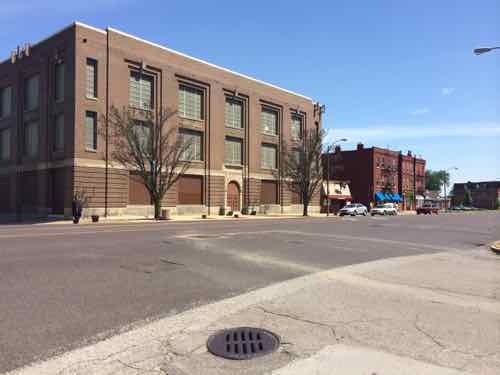 As you head sSouth on Broadway it is bounded by handsome 2-3 story brick urban buildings, but this changes after passing Gasconade St one block further South. 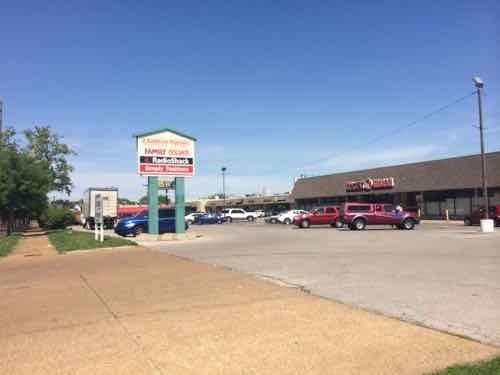 The large 3-story building is owned by Ameren. Even once inside the site getting from building to building is difficult. The old street grid was cut off. Let me preface this by saying this is a rough digital napkin sketch about what I think could physically be built to replace the existing strip shopping center. The intent is to trigger people’s imagination to see this as potentially being redeveloped in a different manner than it has been for the last half century. 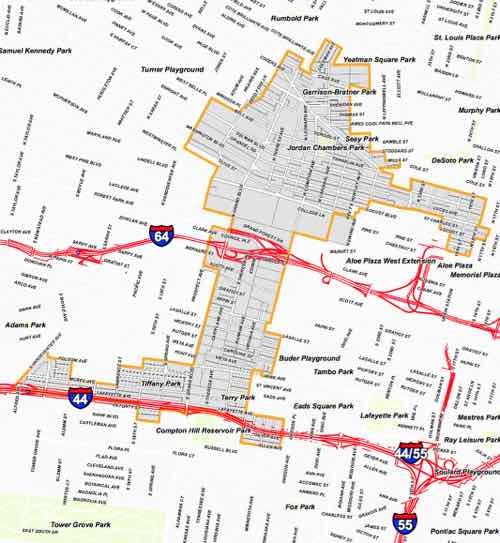 The only other vision I’ve seen put forward was as a park-n-ride lot for a light rail line, see Northside-Southside Light Rail Wouldn’t Be Good For St. Louis Neighborhoods. The best streets have a similar building type across the street, which is hard to accomplish in this narrow site. 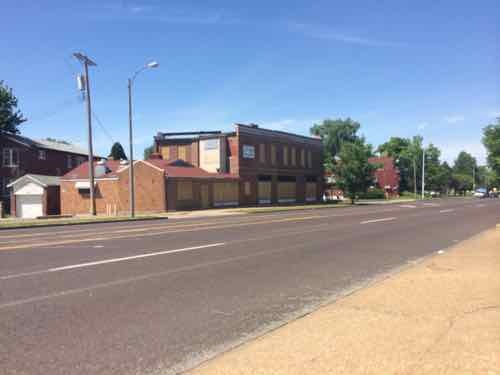 The extensions of Chariton & Meramec would help create quality urban faces on opposite sides of s street. Building on the open areas (purple) would help with changing the feel of Broadway. Broadway and all newly extended streets would have parking on both sides — angled on Broadway and Piedmont Ave parallel to I-55. Narrow drive lanes and curb bulbs would allow vehicular traffic to move but also be pedestrian-friendly. Protected bike lanes are possible on Broadway. The proposed buildings wouldn’t be monolithic masses, these might be several buildings within that newly created block. 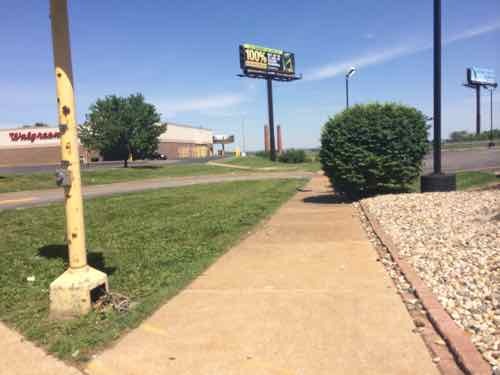 They might be separated by pedestrian-only street parallel to Broadway & I-55, depending upon the depth of the property. They might have structured parking in the middle surrounded by habitable building on all sides. The natural slope down to the highway would help facilitate a level of parking under some/most of the new buildings. A streetcar/BRT line could loop around this project. A light rail stop could be in the center of Broadway. The site has excellent highway visibility. Some taller buildings might have good views of the Mississippi River. 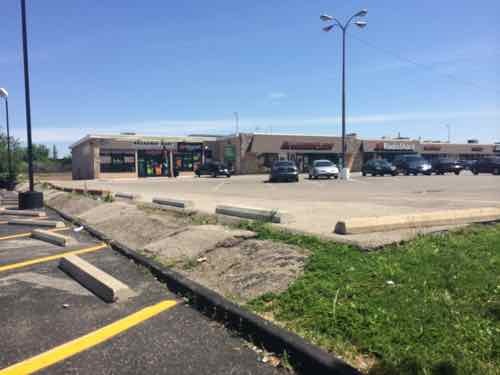 Two gas stations where Broadway & Osceola meet might become one urban station with building in front, pumps behind. Again, this is a rough sketch of an idea that’s been bouncing around in my head. I wouldn’t expect anything to get built exactly as I’ve indicated. I would like to see residers of the 9th & 20th Wards to work on planning for the future of this area — coming up with a form-based overlay to guide what they’d like to see this become over the next 20-50 years.